Strip #1: Bob is a beholder. Gren is a goblin. They fall in love. So what’s all this about, then? 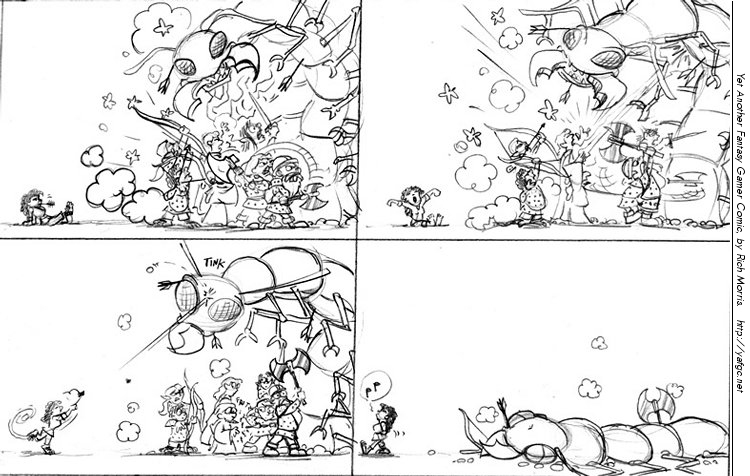 I’m Rich Morris, Canadian artist and animator. A few years back, my wife and I moved to a city two provinces over from our friends and families. To pass the time one day, I started doodling a series of sketches involving a couple of characters drawn from a gaming world I’d been playing in for far longer than I want to think about too deeply. Wanting to practice her webcoding to share the jokes with the friends we’d left behind, my wife put them up on a very basic website that eventually became the site you see here. Since then, those handful of doodles of a Goblin and a Beholder have grown into a wild and tangled world, and diving in headfirst can be a bit daunting. So with that in mind, we’ve created an intro – a ‘cheat sheet,’ if you will – to give you a taste of what we do around these parts. The Archive is thataway, and the strips are divided up by story arc, so you can jump in at the beginning of pretty much any of them and catch on quickly. 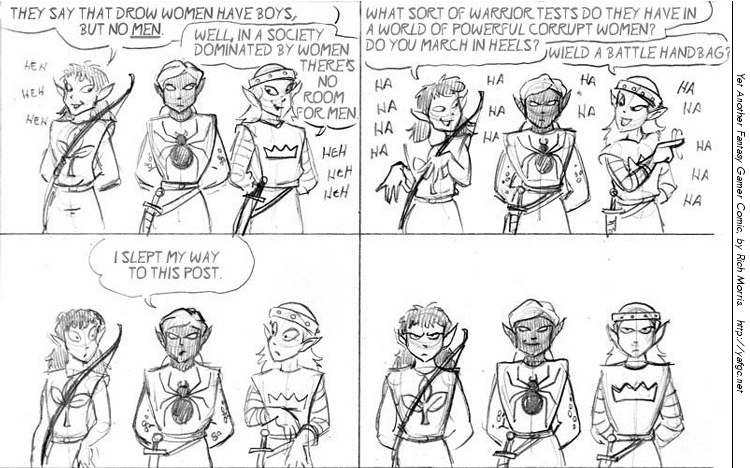 Strip #77: The surface elves and the drow don’t get along here, either. Even at a peace conference. Strip #124: The mixed-breed army unit from the Barony of Grayfort takes on an Ankheg. 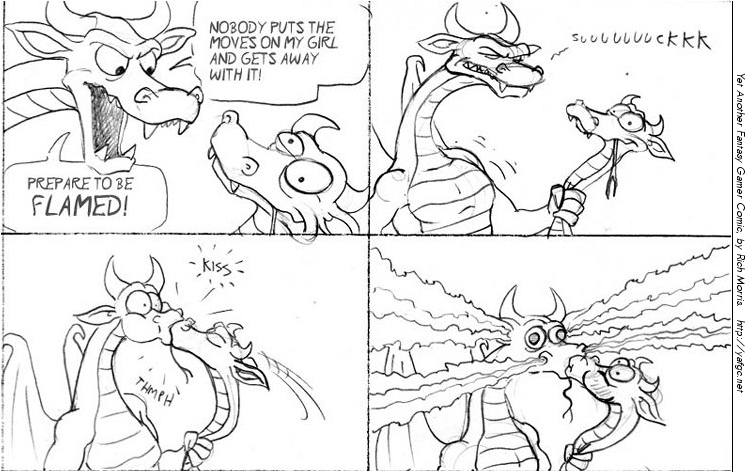 Strip #316: Chimera’s dragon head takes on a romantic rival. 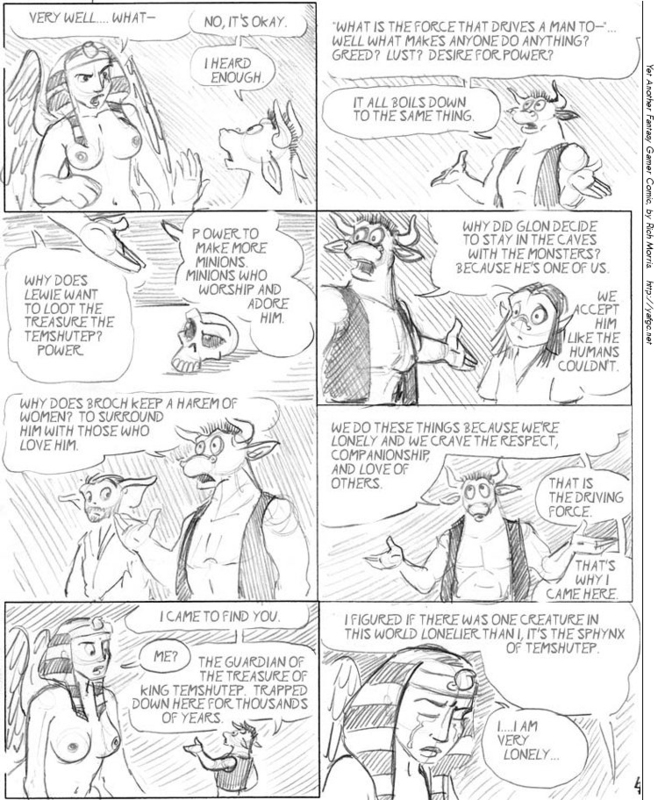 Strip #480: Turg the Minotaur, unlucky in love, explains it all. His quest companions watch on. Strip #1000: End of one collection of story arcs and the beginning of the next. Lucas and Cadugan, unlikely friends and former quest companions, part ways. For now. Welcome, stick around, and we hope you enjoy the strip! You can join us in the forums, over on the YAFGC fan page on Facebook, or drop us a line. And now! back to the main page, or on to the Archive?